New Friends, ready to meet you. Steiff Teddy Happy is 40 cm tall. He is made out of soft brown plush, has a plush nose and safety eyes. This Steiff teddy is stuffed with synthetic material. A Steiff plush toy is machine washable at 30° C and perfectly safe for your child. <?xml:namespace prefix = "o" />Happy has a gold plated button in his left ear. Steiff Teddy EAN 022302 Sophie Teddy, 16cm. Steiff little Teddy Sophie is made out of soft beige plush, has a plush nose and safety eyes. This Steiff teddy is stuffed with synthetic material. A Steiff plush toy is machine washable at 30° C and perfectly safe for your child. Sophie has a gold plated button in her left ear. Steiff Teddy EAN 111617 Lizzy Teddybär, 35cm. 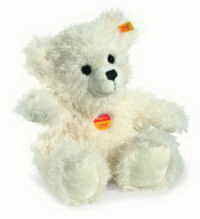 Steiff Teddy Lizzy is a sitting Teddy and is made out of soft white plush, has a plush nose and safety eyes. This Steiff teddy is stuffed with synthetic material. A Steiff plush toy is machine washable at 30° C and perfectly safe for your child. Lizzy has a gold plated button in her left ear. Steiff Teddy Happy is 28 cm tall. He is made out of soft brown plush, has a plush nose and safety eyes. 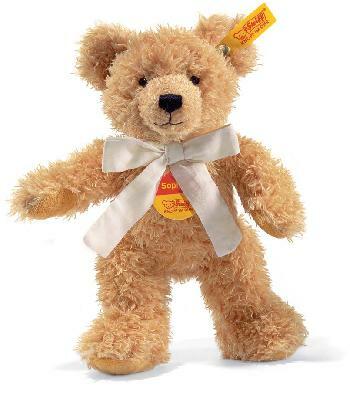 This Steiff teddy is stuffed with synthetic material. A Steiff plush toy is machine washable at 30° C and perfectly safe for your child. Steiff EAN 022456 Elmar Teddy light brown, 32 cm. 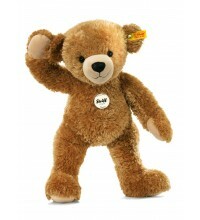 Steiff Teddy Elmar is made out of soft light brown plush, has a plush nose and safety eyes. 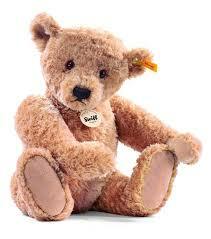 This Steiff teddy is stuffed with synthetic material. A Steiff plush toy is machine washable at 30° C and perfectly safe for your child. Elmar is 5- way jointed and has a gold plated button in his left ear. Steiff EAN 022463 Elmar Teddy, 40cm.